Order one (or two!) today! Who knew? Buffalo, New York, is the new Ground Zero for free-spirited garden innovation? Learn from the stories of everyday, non-professional gardeners who have unintentionally transformed Buffalo’s urban neighborhoods into a 21st century garden design laboratory. It’s all about seeing your space with new eyes and not letting existing limitations on the ground stop you from being out-of-the-box creative. Each July, over 400 private gardens open to the public to show off their fresh, often quirky, take on outdoor living. There’s nothing quite like “Garden Walk Buffalo,” the largest garden tour in North America. The first inspirations for this book were some very special residential gardens in Buffalo, New York, home of the largest garden tour in North America: Garden Walk Buffalo…How did it grow to be such a large and talked-about event? It didn’t happen overnight. It took twenty-some years to get that good, that original. During those years a new kind of garden was evolving, with a particular set of characteristics. They were all lush and traditional enough to be called fine gardens but also quirky enough to spark a new term: a Buffalo-style garden. No matter the size or style, each one had its own kind of welcoming energy and a unique personality that spoke volumes about its creators. No cookie cutter landscapes here. Every garden was built and tended by the gardeners themselves. These are approachable, relatable, livable environments that bring a smile and warm the heart. We (Sally and Jim) are keenly aware that unforgettable gardens occur in other places too. Both of us are gardeners ourselves, and observers of the garden tourism phenomenon far and wide – in Europe as well as North America. We have often talked about the common denominators: What makes some gardens unforgettable? Could we bottle it and sell it, or explain it to others? We knew we could, and the best way to start was with those extraordinary, (mostly) small, astonishingly creative gardens of Buffalo. You’re about to meet some highly individual gardens and the gardeners who created them. Different approaches, different sensibilities, no two remotely alike. You might ask, if these gardens are all so unique, how can there be a Buffalo style? Well, that’s just the point: These homeowners weren’t designing “by the book.” They weren’t professionals – some had never gardened before. But the common design thread connecting the hundreds of gardens of Garden Walk Buffalo is the individual artistic sense of the gardeners, their way of personalizing an outdoor space, their love of the objects and plants they bring to it. And their deep respect for the environment. Now let’s look in on some of these Buffalo-style gardens and see how their owners did it. 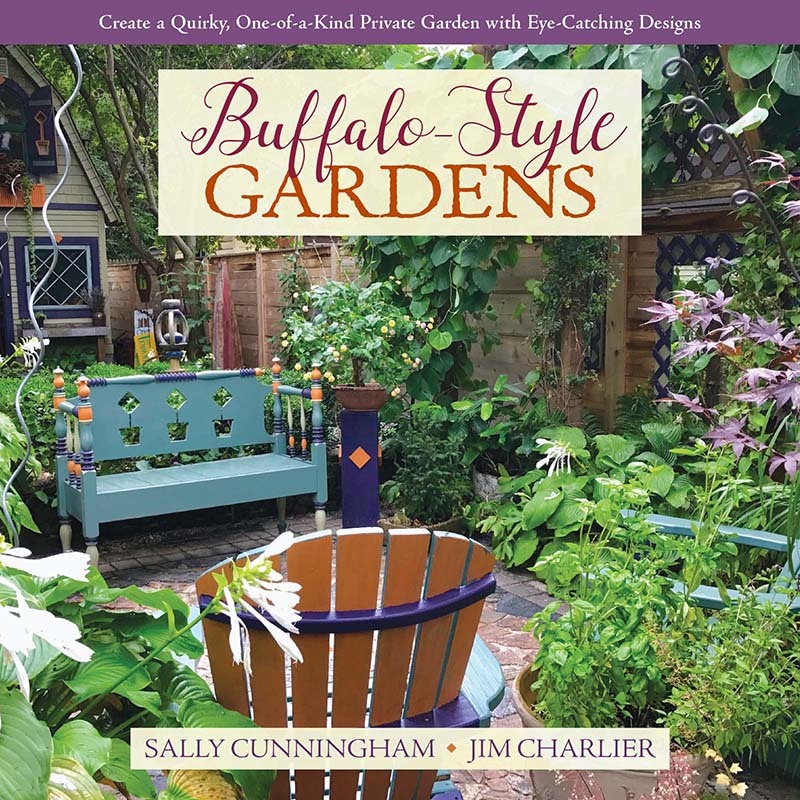 In these pages you’ll find lots of inspiration, design and horticulture tips, and practical how-to’s for tapping into your inner Buffalo. May it roam free as you create your own uniquely wonderful garden! P.S. : If you haven’t noticed by now, this is not going to be just another garden design book. To view and purchase other garden books published by St. Lynn’s Press, StLynnsPress.com.